Henry “Homicide Hank” Armstrong was 21 when he won his first world title in the Featherweight division with a record of 75-11-6 knocking out Petey Sarron, 105-22-13 in 3 rounds at MSG, NY. Mikey Garcia was 23 when he won his first world title in the Featherweight division with a record of 30-0 defeating Orlando Salido, 40-11-2 by TD8 when Garcia suffered a broken nose from Salido’s head. Garcia made one defense. Armstrong was 28 when he won his second world title in the welterweight division with a record of 90-11-6 though only weighing 133 ½ defeating Barney Ross, 74-3-3, over 15 rounds at MSG, NY. Garcia was 25 when he won his second world title in the Super Lightweight division defeating Roman Martinez, 27-1-2, over 12 rounds at Corpus Christi, TEX. Garcia made one defense. Armstrong was 29 when he won his third world title in the Lightweight division winning a split decision over Lou Ambers, 75-5-7, over 15 rounds at MSG, NY. Armstrong would make one lightweight defense while still holding the welterweight title of which he made five defenses. Garcia was 29 when he won his third world title in the Lightweight division knocking out Dejan Zlaticanin, 22-0, in 3 rounds at MGM Grand, Las Vegas, NV. He made one defense. 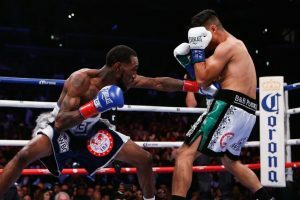 Garcia was 29 when he won his fourth world title at Super Lightweight Diamond defeating Adrien Broner, 33-2, over 12 rounds at the Barclay Center, Brooklyn, NY. Garcia was 30 when he won the world Super Lightweight division defeating Sergey Lipinets, 13-0, over 12 rounds at Freedom Coliseum in San Antonio, TX. Armstrong, of L.A., CA, ended up with a 152-21 (9), record over a 13+ year span. Garcia of L.A., CA, has a 38-0 (30) record over a 12 year span.